Swing set Installer NJ - Kidkraft Cedar Summit Copper Ridge Playset from Costco installer- Gorilla Playsets assembly and installation. 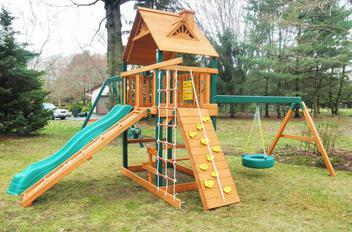 We provide swing set Installation ,Playset Installer, Swingset Installer NJ NY, 50 miles radius of 07032 for service. 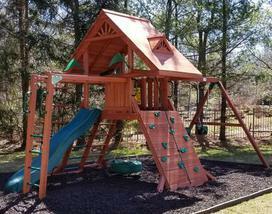 Why Hire Us to Install your swing set? Swing set installation is all we do. Fully Insured. Fully registered business. Call and talk directly with Dan the installer. Hi, my name is Dan and thank you for visiting my website! NY: Rockland,Westchester , Staten Island. For Spring and Summer, schedule fills up fast. Don't wait until the last minute to book the service. I assembled this swing set in 2007( 2007 Costco Sunray made by Rainbow) . I came back recently to do minor check up and re-stain service. 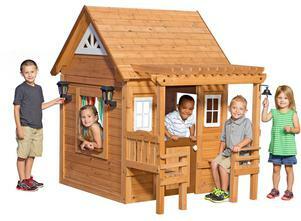 The playset was still the same level, plumb,sturdy and safe for kids to use. Years of intense use and its structure was solid as when it was first built. Drive around your neighborhood, and you may find a swing set that is leaning, all crooked or all wobbly, that's because the set was never installed properly in the first place. When a swing set is originally installed ,safety and quality workmanship should be taken into account. And this is what I do for all my customers,so there's no need to worry, even years down the road. If you have young children, you need to make sure your swing set can last a long time. 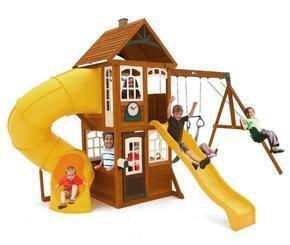 Hiring the right person to install your swing set is just as important as the choice of your outdoor play unit. Quality service really counts. Build it right the first time! 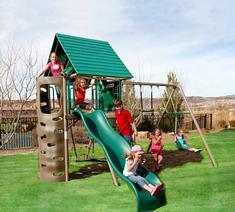 *All Swing sets are guaranteed by our company to be as level as possible. * One Year worry-free workmanship warranty. 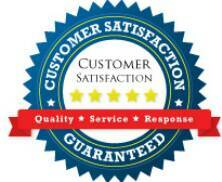 * We are an independent company not associated with any store or manufacturer. * A deposit is required to reserve a date for any services. The deposit is non refundable in case of a cancellation of any reason. Below is an exemple of exactly what happens when you hire unreliable, inexperienced, irresponsible installation company that will send just about anybody to install your swing set. 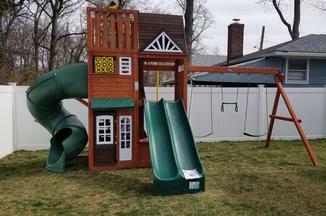 The customer thought that buying a swing set with installation included or hiring a company that subcontracts their work would be a great deal. It's just not that simple! Do not hire a company that sends subcontractors. That's why it's better for you to buy a swing set, have it delivered to you house and contact me (directly) with no third parties involved. If there's an issue...I can solve it. I found this review at a very well known website. "Location: NJ - Pros: quality products - Cons: installation service"
"...We were not aware that the actual installer was subcontracted by the installation company, and HAD NO IDEA how to put the thing together. We were told it would be about 4-5 hours, however this was not the case. After about 15 hours the installer felt he had it all together, Unable to see what was done (since they finished in the dark) I reviewed everything in the morning and found several issues. #1 they did NOT clean up after themselves. Packages from tool bits (guess they had to even buy tools) were on the ground as well as cigarette butts, extra bolts, manufacturers plaque and cardboard from the packaging. #2 they installed broken pieces – several pieces were chipped, cracked and 1 main beam was split straight through (don’t know if they over-tightened or what) – the plastic slide was scuffed up and very rough/sharp spots at top end. – screw points from the slide mounts protrude thru the bottom and are sticking out under the slide. #3 they installed parts backwards. #4 they didn’t know which way to put the bolts in, so they just drilled out the wood and made the bolts fit where they wanted. Some bolts face in and some they drilled to face out. They used washers to fill space where the bolts were backwards. Today I was able to contact the “Installation company main office” and they advised me that this will all be resolved. I PAID for installation because I thought a professional who was experienced would be installing the product. The manufacturer assured me that all of the installers are trained, but that was not the case..."
​A $75 deposit is required to book an appointment.